Sliding Drawer Latter Tray holds files and letters. 4 Side Storage Pockets. Two compartments for each side for your ipad, cell phone, calculator, pens and other office supplies. 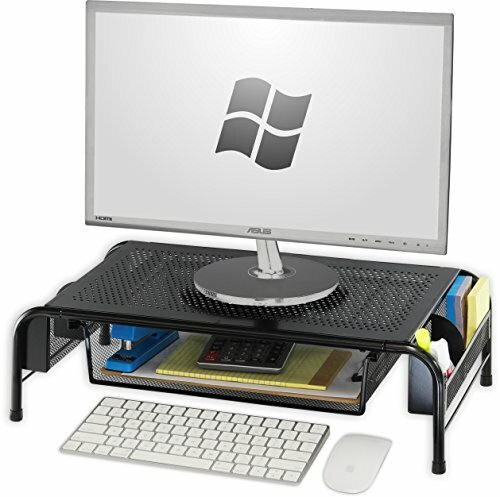 PROFESSIONAL GRADE COMPUTER MONITOR STAND raises your monitor to just the right height for comfortable and healthy viewing. No more back and neck pain during hours of use. This stand lets you adjust to just the right height from 3 inches to 5 inches. You will love the elegant design that is so sleek and fashionable. STURDY, VIBRATION FREE, DURABLE thanks to the quality steel construction. Keeps your monitor rock steady. Easy to assemble taking just minutes and requiring no tools. We also use rubber skids on the bottom to hold the stand steady and prevent unwanted movement. The rubber also protects your desktop of scratches and scaring that often happens with lesser monitor stands. MEASURES 14.5 x 9.3 Inches that's a very compact footprint that doesn't take up much desk space. There is plenty of space underneath for storing papers, electronics, or hide your snacks at work. This stand is very sturdy holding up to 44 pounds and accommodating all monitor sizes. 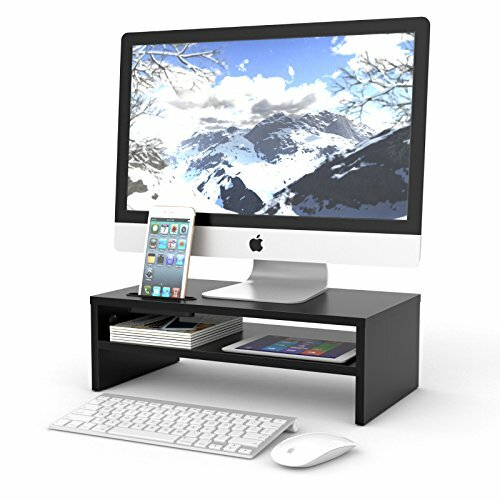 Use this as a flat screen riser, laptop desk printer stand, adjustable stand and much more. 100% MONEY BACK GUARANTEE ensures this will be your best bet for a no-risk purchase. Many people love this stand so much they return to buy a second one for their other computer or the one at work. It makes a much-appreciated gift for friends, family, and co-workers. IMPROVED ERGONOMICS for reduction of back and neck strain and pain. Use this computer monitor stand to easily raise your monitor to just the right height for comfortable viewing at 3" to 5". You will notice the difference right away. Stay comfortable and get more done! SLEEK, FASHIONABLE, ELEGANT DESIGN makes this monitor riser a very nice accessory for your desk and office. Make of durable black steel. It's smooth and feels great with vented top surface. Holds up to 44 pounds including most monitors. COMPACT SIZE doesn't hog desk space like other bulky stands do. Measures just 14.5 x 9.3 Inches. Plenty of storage space under to keep game console, controllers, books papers and other items. STABLE WON'T SLIDE, SHAKE, VIBRATE. We combine super durable steel construction with non-skid rubber underneath for a flawless experience. The rubber keeps the legs in place and protects your desk surface from scratches. 100% MONEY BACK GUARANTEE ensures this will quickly become your favorite no-risk purchase. This makes a great gift for birthdays, anniversaries, Christmas, and anyone who just got a new computer. Keep Your Screen Confidential and Private Many things in life are better when shared. Your laptop screen is not among them. 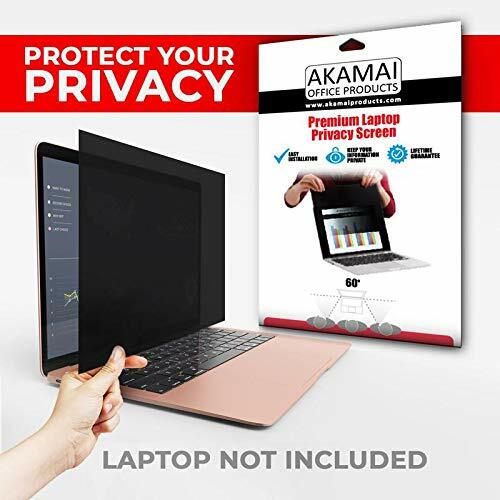 This Akamai Office Products' laptop privacy filter keeps your confidential and private information just that -- private. This filter mounts to your laptop screen and utilizes privacy technology so only people in front of your computer (or directly behind you) can see your display. Nosy coworkers, competitors, and strangers will only see a black screen. Only Fits 14.0 Inch Screens (Measured Diagonally, Corner to Corner Excluding Frame) This particular size privacy filter fits widescreen laptop computers with 14.0 inch screens (measured diagonally from opposite corners). Actual filter dimensions are 12.20 inches wide x 6.85 inches high (310 x 174 mm). This filter is designed for screens with an aspect ratio of 16:9. If you are unfamiliar with your computer's aspect ratio -- as long as the horizontal and vertical measurements above match your screen's measurements, the screen will fit. What Size is My Screen? Search for your laptop's brand and model number online to find the screen size. or Measure the height and width of your screen. Do not include the frame in your measurement -- only the viewable area itself. This length is the privacy filter size you need. Package Contents 1. 14.0" privacy filter (diagonal length) 2. Clear adhesive tabs to securely hold filter on screen (Installation Option 1) 3. Double-sided tape squares to adhere filter directly on screen (Installation Option 2) 4. Installation instructions Rest Assured with Akamai Products' Lifetime Guarantee If you are ever unsatisfied with the performance of your privacy screen, we'll refund your payment! TOP QUALITY & EXACT FIT FOR 14.0" WIDESCREEN LAPTOPS - Our Privacy Filter is a perfect fit for 14.0" Inch Widescreen Laptops which have a 16:9 aspect ratio (compare screen dimensions to 2nd photo before purchasing). Unlike other privacy screen protectors, ours has 8 layers of film that help ensure your privacy and also provides other important benefits to you. Not designed for touchscreens. Be more comfortable & secure in entering your passwords and viewing personal content. FREE BONUS ADHESIVES - SIMPLE TO INSTALL - Each privacy screen filter protector comes with 2 different attachment options that offer you 2 easy ways of installing the privacy screen-one comes as a part of the standard package & the second installation kit is offered as a NO COST BONUS by us. Option 1 consists of Optically clear adhesive attachment strips & Option 2 consists of Slide mount tabs - both of these are very easy to use, enabling anyone to install and remove very easily. This simple and economical monitor stand is made of quality MDF, black colour which matches most furniture, adds an elegant look to your desktop. Modern creative design, desktop tidy organizer, no mess any more! Perfect to fit mac mini, laptop, printer, raises monitor to a comfortable viewing height while maximizing work space, and reduce eye strain and neck and back pain. 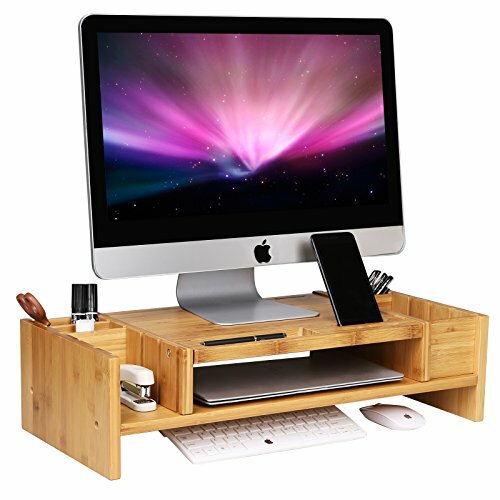 Except the holding slot for cell phone, it also has some space below the stand for you to place things such as keyboard, DVDs, notepads, sticky notes, and other office stuff. If both functional and efficient is what you are looking for, then our stand is really unbeatable value for money! With its portable character, you can use in any place, such as office, study room, bedroom etc. Comes with instructions, quick and easy assembly. 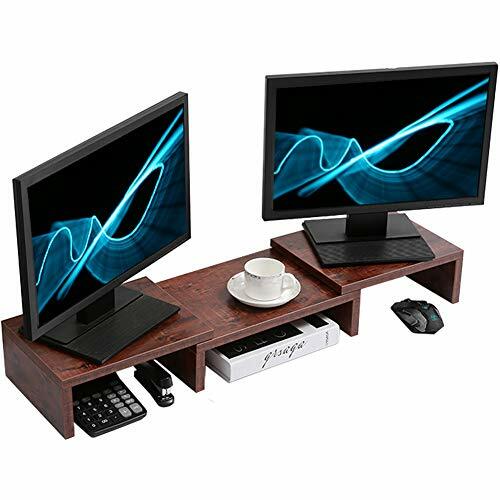 Multifunctional, can support PC monitor/screens, laptops, printers, fax machines, computer screen risers, TV monitor stands, keyboard shelf racks etc. (Maximum Holding Capacity 66lbs). Smart and sturdy design, space-saving keyboard slide underneath, includes holding slot for smart phones, a hub for cable management. Measuring 5.6'' in height, which raises your screen for improved visibility and reduces neck and back ache. A must desk accessory for home & office use. Suitable for any place in the home, such as study room, office, living room, bedroom. Easy to assemble with instructions provided. Reams of paper lifting your monitor up? With a cool modern design the Perch monitor stand raises your monitor for maximum comfort, reducing eye and neck strain, all while organizing all your desk accessories. This SONGMICS monitor stand is great to change the way you work, study and play. Made of high quality bamboo board, it's durable to accompany you for a long time. The large top surface could accommodate your appliances well. The lower shelf is for keyboard, cooling fun, mouse, books and folder storage. Slots and compartments conveniently organize your cellphone, pens, sticky notes, USB disks, paper clips and earphones. Polished smooth corners and countersunk screws help protect you from bumps. - Clean the product with dry cloth. - Keep it in a dry place, avoid sun exposure and humidity. 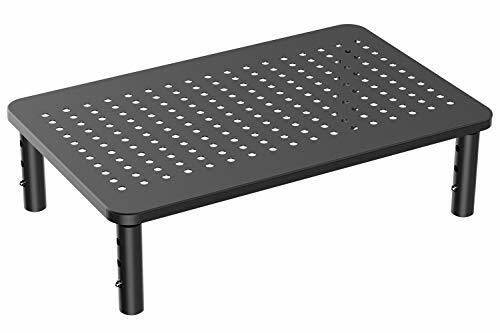 This SONGMICS monitor stand is great for your monitor, laptop, TV, printer, fax machine, speaker, kitchen appliances and game consoles. Made of high quality bamboo board, it's durable to accompany you for a long time. The large top surface could accommodate your appliances well and you may put the keyboard or cooling fun underneath. Removable storage organizer provides 4 options to create your own ideal layout and provide extra space for your books or files. The 2 in 1 groove and 1 regular carved out spot keep your essentials like pens, sticky notes, USB disks and earphones at your fingertips. Long slot is for cellphone/tablet storage and the built-in holes are for convenient charging. Notched handles help you move it from one place to another easily. Polished smooth corners and countersunk screws help protect you from bumps. 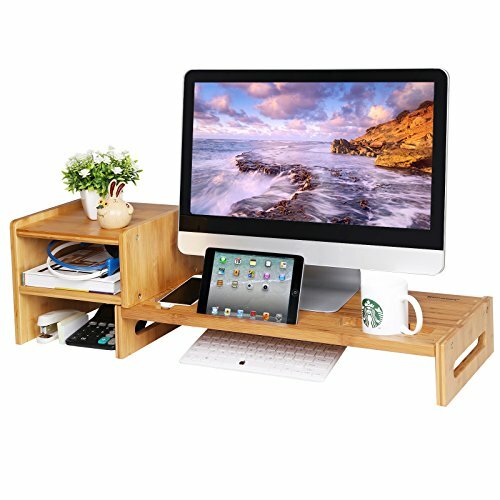 100% BAMBOO&PATENTED MONITOR STAND: 100% natural bamboo, eco-friendly and renewable, add elegance to your home d cor; durable frame holds up to 80lbs. Patented product, designed by Kira from the SONGMICS production team. Replace your monitor's original base with VIVO's single free-standing mount. 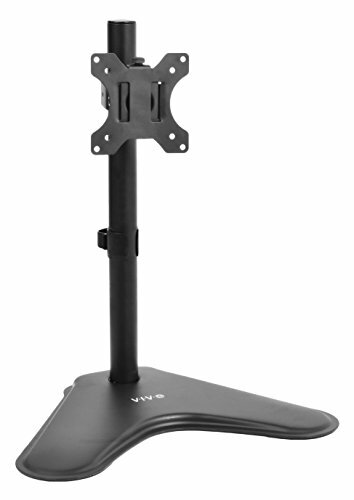 STAND-V001H uses an 18" center pole giving users the ability to adjust the screen to an ergonomic viewing height which will help reduce neck, back, and eye strain. Features include removable VESA plates for easy monitor mounting, and clip on cable management to keep AV and power cords cleanly organized. The mounting face offers 15 tilt, 360 swivel, and 360 rotation, allowing the user to set the monitor to their preferred viewing position. The entire mount is supported by a solid steel 12.5" x 10" base providing great stability. 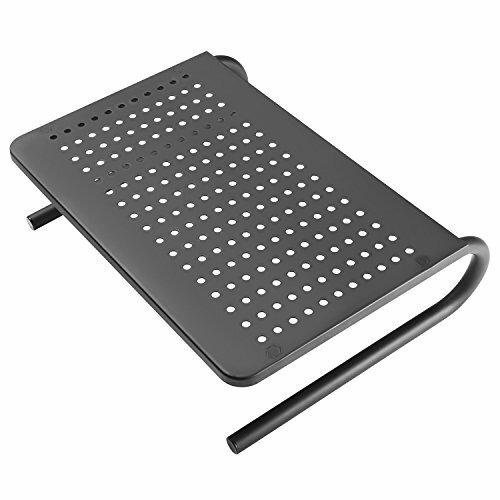 This stand is compatible with VESA 75x75 & 100x100mm mounting holes. 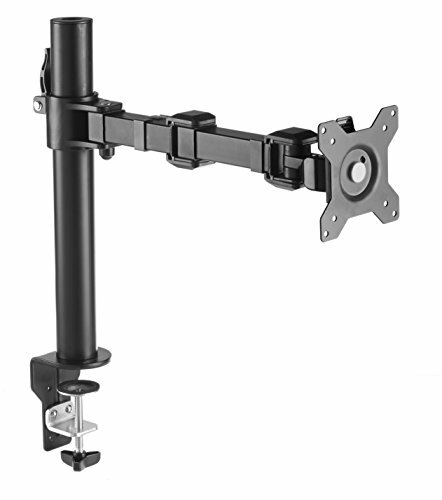 Fits most LCD monitors 13" to 32"
Your new monitor mount will lift your monitors to your perfect ergonomic height. The ability to twist and rotate your monitors with your new mount will make your ideal set up possible in just minutes. Say hello to working smarter - not harder. AND Say goodbye to any neck or back pain! The Stand Steady Monitor Mount will give you endless possibilities to turn and flip your monitors in a way that best suits YOU. 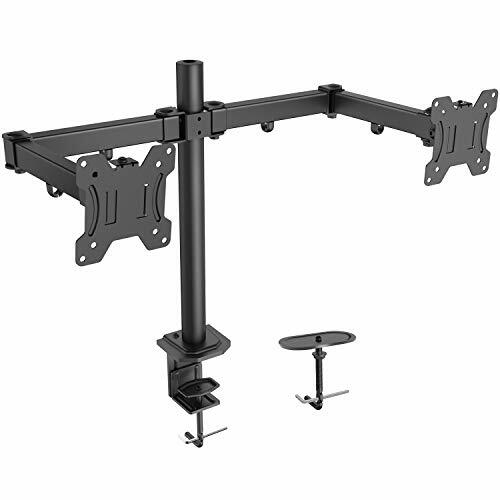 FITS MOST MONITORS: The Stand Steady Monitor Mount will fit most standard office desks, standing desk converters, and existing workstations; will fit screens 13 to 32 inches in size, and up to 17.6 lbs. per arm. 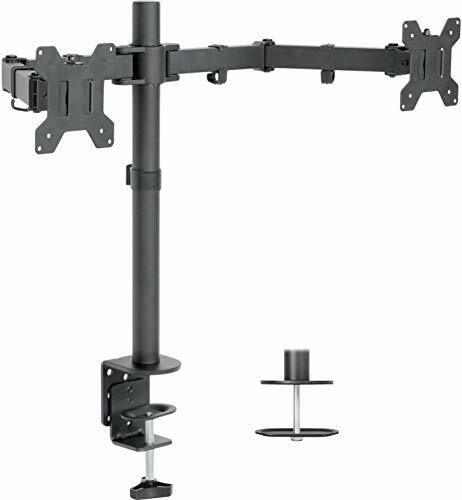 FULLY ADJUSTABLE: With your swivel monitor mount your monitors will get full motion articulation, spin 360 degrees, rotate +90 & - 90 degrees, and tilt +45 & -45 , along with height adjustments from 3 - 35 inches. EASY INSTALL w/ SLIDE ON VESA: Use either the mounting clamp or grommet to mount it to your desk. Slide on VESA plate makes it easier AND safer to connect your monitors to the arm. BONUS CABLE MANAGEMENT: Featuring bonus cable clips on arms and center pole to keep your cords in place and your workstation organized! WATCH OUR VIDEO: Instead of telling you - we'd rather show you. Check out our video in the photos section! Fully articulating desk mount stand - improving the ergonomics of your office workstation. 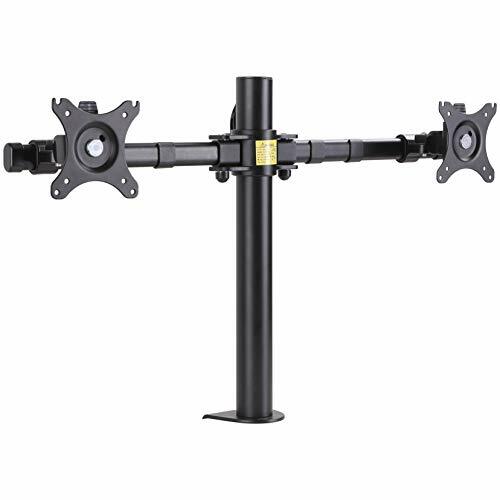 adjusting this stand to the ideal position is a breeze with full motion arms, featuring six top joints with 180 Degree articulation, 45 Degree tilting angles for your screen, and 360 degree rotation. Positioning your monitor in the optimum position improves your posture and helps reduce fatigue and strain on the neck, shoulders, and eyes, makes you more comfortable whilst you work. sturdy base & space-saving - increasing more usable desktop space and work efficiency. heavy duty 3 inches C-clamp easily secures to the edge of a desk or table, The grommet mount base option can be used with desks that have a hole to secure through. Raising your monitors off the desk surface with this dual mount clears up valuable work space on your desktop for your keyboard, laptop or other important projects. adjustable & removable VESA plates - makes it easier and safer to connect your monitors to the arm. 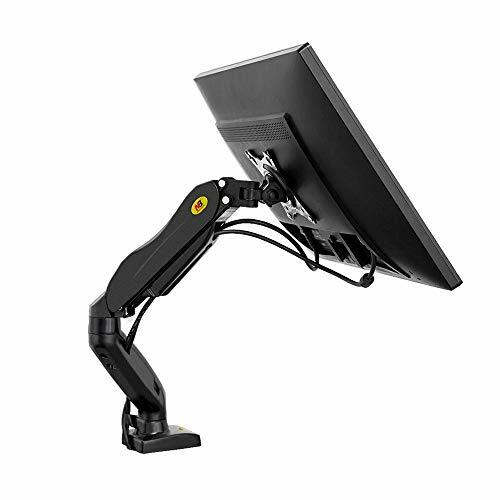 sturdy construction & integrated cable management The sturdy, high grade steel construction of HUANUO dual monitor mount is sure to keep your monitor safe and secure. Built to hold up to 17. 6 lbs., It is capable of holding the majority of monitors on the market. Additionally, the stand comes with cable management to neatly organize monitor cables. You may have difficulties with placing your computer, TV, media speaker or printer in many cases. SUPERJARE monitor stand riser can help you with the problem, this will make a big difference in getting your home or office more organized. When you place your monitor on the stand riser, you may regret that you didn't find it earlier. This multifunctional stand riser can help you to view the monitor in a comfortable position and organize your devices to save more space. If you are a regular computer user, You may feel uncomfortable in the neck after working with the monitor for a long time. This monitor stand riser will raise your monitor so you don't have to work in a uncomfortable posture. Length and angle can be adjusted according to your needs. One, two monitors can be placed on the stand riser, and place your clutter or mluti medial speaker underneath. It will be a fantastic option to make your workplace spacious and orderliness! Easy to set up! With considerate construction, you can assemble it in seconds! Cervical spondylosis ranks second in the World Health Organization's Top Ten Persistent Diseases.There are over 900 million people in the world suffer from cervical spondylosis. The survey shows that the number of adolescents and office workers under 30 years with cervical spondylosis is increasing rapidly and younger trends obviously. Long-term poor posture is the main cause of cervical spondylosis. ISINO desk monitor stand with storage designed to help people maintain correct posture in front of computer work and study by raising the display screen to the appropriate height, so as to protect cervical vertebra and vision and prevent various health problems. 13MM E1 GRADE MDF Isino wood monitor riser selecting high density E1 grade MDF BOARD with CEC National environmental protection Certification,is anti-corrosion,NON-DEFORMATION and safe.After 350 high temperature pressing, the CLEAR WOOD GRAIN TEXTURE coating surface without painting is healthy,solid,wear-resistant,and moisture-proof,easy to clean.Also ,corner edge strictly sealed and polished by CNC numerical was smooth and anti-scratch. ERGONOMIC DESIGN 8 cm desktop screen stand is confirmed to be the BEST HEIGHT FOR EYES and NECK.DEPTH at 20cm,SPACE SAVING for desktop ,no worry about the inconvenient working experience caused by over-occupied space of over-deep monitor shelf. 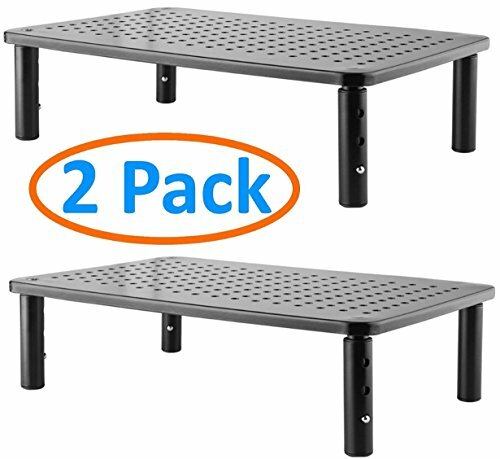 3 levels shelf HEIGHT at 22.8 cm,highly EXPAND the WORKPLACE HORIZONTALLY and VERTICALLY least 50 cm.13mm THICKNESS BOARD,weight at 7 lbs enable computer monitor raiser STURDY ,durable and anti-skid,withstand weight of 100lbs. FINE HARDWARE The vertical monitor stand adopting high quality carbon steel SELF SCREW is more strong and non-wobble.BLACK CLOLOR SCREW matches desktop corner shelf greatly.Screw hole are processed smoothly under 0.02mm precision.FLAT and CROSS SCREWDRIVER,install manual included for easy install and MULTIPLE USE.Compared to mount monitor arm stand,pc screen stand is convenient to use and move,no harming the wall without to drill and fix .Opening design,easy to reach and switch. 6 SECTIONS EXPAND WORKSPACE Isino monitor stand is a space saving desktop organizer shelf with large storage capacity storage.3 LEVELS STORAGE SHELF allows for phone,notebook,papers,speakers,books,peripherals,charging station,usb hubs,DVD, calculator,pen,plant organization.Wood riser available for 17-22 Computer,LCD screen riser,laptops,TV holder ABOVE,and mouse,keyboard,files storage UNDERNEATH for dust proof,avoid data loss.Flexible Independent structure fits for any length of desktop. WIDEN USAGE Isino Universal desk corner monitor riser could help you DEVELOP BETTER SITTING POSTURE and INCREASE OFFICE PRODUCTIVITY by raising your screen to ERGONOMIC HEIGHT.It can be used in computer training room or classroom for students, trainers and trainees to release cervical spine;Also be widely used in home,office,school,kids playroom,dorm,factory to reduce neck & back pain.Also a best gift to colleague,friends,mother,father,wife,husband and children.